Blur Busters Forums • View topic - G-Sync requiring very low FPS cap? G-Sync requiring very low FPS cap? Re: G-Sync requiring very low FPS cap? Yep, looks like something broke in recent RTSS versions then. Dxtory's OSD at least reports some of the framerates above the cap though, unlike RTSS. I assume that I would be better off just allowing the game to run at 100Hz uncapped than using NVIDIA's Framerate Limiter though, since it seems to add as much latency as V-Sync - and possibly more than V-Sync on a G-Sync display? Hm @Glide, you may be onto something. Do you have the Creator Update installed on Windows 10 by any chance? I do, and just did some testing in Overwatch on two separate G-SYNC monitors, and with either the built-in cap or RTSS, the refresh rate meters would occasionally spike to the max refresh rate of the display, regardless of the framerate limit. I tested this with game mode/game bar off (never have them on), and also enabled/disabled the "fullscreen optimizations" option newly introduced in the Creator's update, and the behavior didn't change. I could be wrong, but I don't remember this behavior before the Creator's update. I know they changed some system DLL files. I'd test it without G-SYNC, but then obviously the built-in meters don't read any fluctuations, as the refresh rate remains constant. I was going to start my input latency re-tests tonight, but I may have to hold off until this is resolved. Regardless, I will probably do a couple of quick tests to see if these apparent spikes have any impact on input latency. Hopefully the Creators update is simply causing the built-in meters to report inaccurate refresh rate readings for whatever reason. Yes, I'm using the Win10 CU and have tried those settings too. I just built a new PC so I haven't used G-Sync with anything else. Accounting for my error margin of <1ms, along with possible variances between multiple runs (I only did a single run with 10 samples each scenario for this test), and the difference is likely a maximum of 1-2ms between the two, and only in certain areas of the screen; frames render to the middle of the screen at virtually the same time in both scenarios. Seeing as frames at 100 Hz render in 10ms, the conclusion is there is no sync-induced input latency (nothing close to full frames worth) with G-SYNC + v-sync on + in-game 98 fps limit vs unsynced at the same framerate limit, even when the built-in refresh rate meter reports a 100 Hz spike. 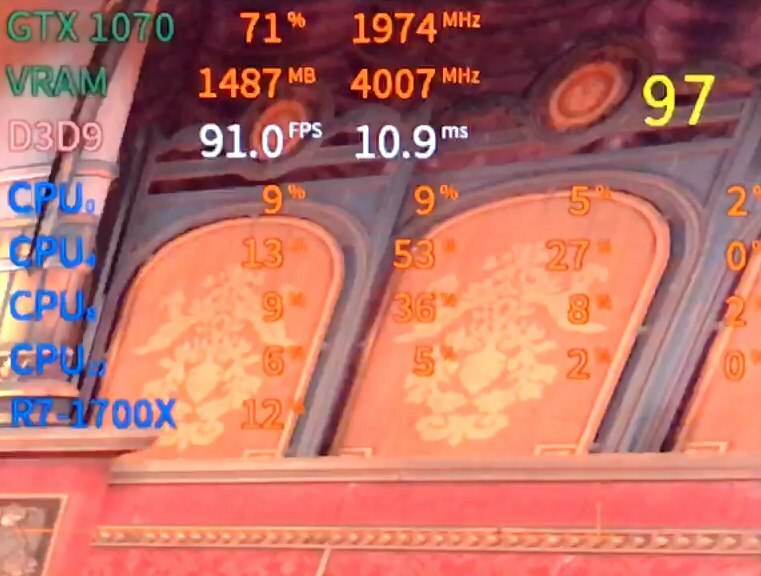 Any increase, however slight (1-2ms max) is due to G-SYNC frametime compensation preventing tearing in the upper fps range; G-SYNC + v-sync off + in-game 98 fps limit would tear in the same instances. 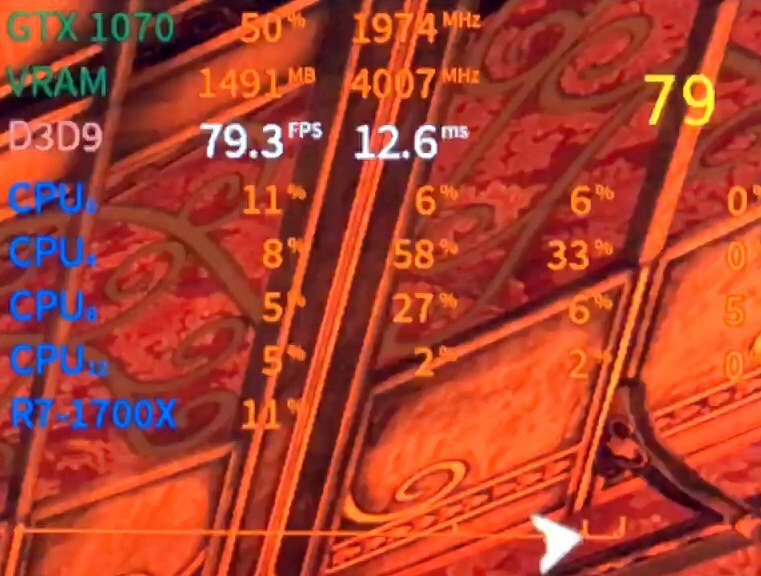 This, of course, is not an exhaustive test (those are coming up in my next G-SYNC 101 article entry), but all appears to be expected behavior, even with this apparent refresh rate meter glitch. I just tried Dishonored. RTSS is unable to cap this game, if I run the game with RTSS already running. If I quit RTSS, start the game, and start RTSS afterwards, the cap works. Can you test if this is the issue you're running in? Quit Afterburner (quitting RTSS with Afterburner running doesn't work) before starting the game. Then alt+tab to the desktop and start RTSS. So I'm not sure how the frametime data are to be interpreted. The "MinSmoothedFrameRate" value doesn't matter. The cap is given by the "max" value. Strange, RTSS works just fine for me if it's already running before I start the game. Using the game's framerate limiter I still have to cap it to 92 FPS to prevent it from ever hitting 100 during gameplay. Is that all the "smooth framerate" option does though? At least when it's inside the specified range. There's also a "OneFrameThreadLag" option for UE3 games which I've heard can reduce latency further if you disable it, but I've not seen any measurements. The game feels really good when it's never allowed to enter a V-Sync on state, but I'm still unsure about whether to cap it this low, or pick something like 98 where it is staying under 100Hz 95% of the time, vs capping at 87-92 depending on the limiter used to prevent it from ever hitting 100Hz. The in-game limiter is virtually 0-lag. The Unreal Engine really has one of the best frame limiter implementations out there. So if you hit vsync, it should be noticeable immediately with the mouse. The "bsmoothedframerate" thing just means the frame limiter is dynamic. For example, if you look one way in the game and your FPS drops to 50, then look the other and normally get 90, it just raises the limit slowly. It doesn't jump from 50 to 90 immediately, but raises it over a period of 1 second or so. This is a good thing, since "jump cuts" in frame rate are too jarring, even with g-sync. It doesn't affect the frame limiter's latency. But if you don't like the effect (why?) then you can just set both min and max to same value. "bsmoothedframerate" must be "true" in all cases though, otherwise the frame limiter gets completely disabled, no matter what you set the min/max values to. So in the end, I can't really explain your results :-/ I suspect it might just be an indicator issue, and there's nothing to worry about. 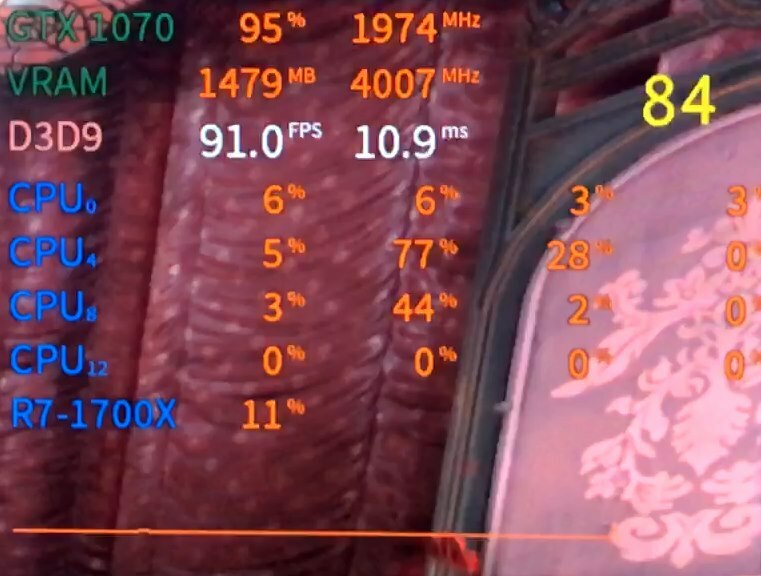 If you can't feel any input lag in Dishonored with an in-game 98FPS cap, then I'd say you're not actually hitting 100FPS, no matter what the monitor's OSD says. Limiting framerate and logging frametime from two different 3D hook applications is not the best idea as well, you may not see the real picture depending on injection order (which is normally defined by hook application start order). For example, imagine that FRAPS hooks frame presentation routine first and RTSS is the second in injection chain. If 3D application render frame in 6ms and framerate limit is set to 60FPS in RTSS, then FRAPS will intercept frame presentation first and log it as is, i.e. show you 6ms then RTSS will intercept the frame and spend 10ms waiting to provide 60FPS limit, so frametime before actual frame presentation will be 6+10ms, but you'll see just 6 in FRAPS log. Then the FRAPS bench shows more stable frame times without huge frame rate spikes. The latest RTSS beta has an option to update the counters every frame now instead of polling, and the option to disable averaging. With Afterburner/RTSS being the only overlay injected, and RTSS handling framerate limiting (to 91 FPS) I'm still seeing it miss a lot of drops or times when it exceeds the limiter.